Im looking at using a solid state relay to control fuel pumps and engine fans but not 100% sure on the best way to wire them. Googling shows there are several ways it can be done but you cant believe everything on the net. The SSR manual talks about using a diode to protect the relay against voltage spikes when turning off a inductive load, Another bit im unsure on. Also is it possible to read the output voltage from the SSR to the fuel pump and have that inputted into the ECU? 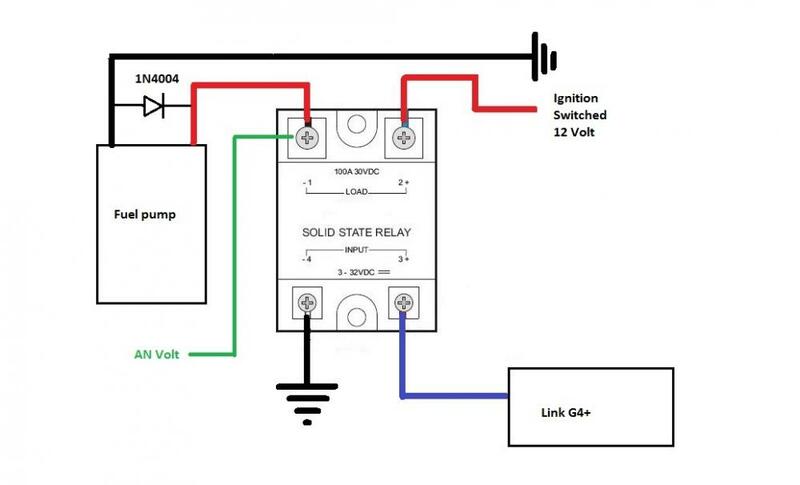 Yes, it would be possible to have the solid state relay output feed back into the ECU. You could either use a digital input channel or an analog volt channel. The digital input would give you an on/off status or a frequency (if using PWM control), and the analog volt channel would give you an actual voltage. So like the below pic then? If I wanted to read the voltage to the fuel pump would I need to use the GP input function of the AN volt channel? I use these same solid state relays to drive AUX injectors also. The pins 3 and 4 need to be changed . 3 - should also be a 12 volt ignition switched supply. As for the fuel pump power input back to the ECU , No you can not as the inputs are only designed to run 0 - 5 volt only. Can we add a 0-12volt input to the wish list please. Assemble a resistive divider in the power cord from the electric pump. So that the voltage at the analog input is a maximum of 5V. And only put two resistors in series to the ground and remove the middle control voltage of the two. Divide it down by 10, so you could monitor it so at 13.7 volts it would be measured as 1.37 volts. Will request higher voltage 0 - 14 volt or so. Dave im having a Dual voltage divider made, I can send it to you for testing if you would like. I fly to Brisbane this week on Wednesday for major surgery so it might have to wait a few weeks if you want it tested on the simulator mate. Shouldn't that divider circuit be on the Fuel Pump positive side. For those that are interested Ocean Controls in Australia sell dual channel voltage divides. Tested and adjusted mine on a constant battery voltage today and worked well. Still have to test which side of the SSR the signal needs to come from. The solid state relays work fine when wired up using the last wiring pic. I didn't end up using the voltage divider as I run out of voltage inputs. Worked fine when I connected it to the battery. When I'm on days off again I'll test it using PWM and post a log file. Quick bump, I have followed the last diagram in this topic as well as checked other wiring diagrams and confirmed manufacturers diagram with no luck. Ive killed two SSR so far, at first thought the first one was faulty so exchanged but the second is the same. Runs for 5mins, then pumps start surging, Led flickers and it burns out going normally closed shorted and pumps run til the battery is disconnected. Pulled it apart and the diode is burnt out. Relay is the typical 100A item in the diagram above, running 2x Walbro 460 fuel pumps. Link output to the negative terminal of control side is set to Fuel pump speed as advised. What part number ssr? Note there are AC and DC relays. I'm using 3 currently wired like the last pic for water pumps and 2nd Bosch fuel pump. What's the setting in FP speed? The 12v switched power to the control side was looped out of the lift pump relay when the ECU pulled that in. The Fuel Pump Speed table was set to 30% at idle IDC. What are the settings in the fuel pump control tab? There should be offset and multiply values. I would start by changing from fp speed to a GP output. Make sure it works without faulting. Change to to GP pwm next. See how that goes. I have recently changed my fuel setup from big (useless) fuelab pump on a surgetank, to 2 x walbro 460's in tank. Initially they are staged, and working as expected, but the fuel (and differential) pressure increases more than I would like with the 2nd pump on (between 25 and 30kpa). Long term, I am concerned about having 1 pump dormant majority of the time, so I would like to run them together, but this comes with the downside of increased fuel flow (heat, which I have had issues with). So, I would like to try the SSR method of PWM control on both pumps together. 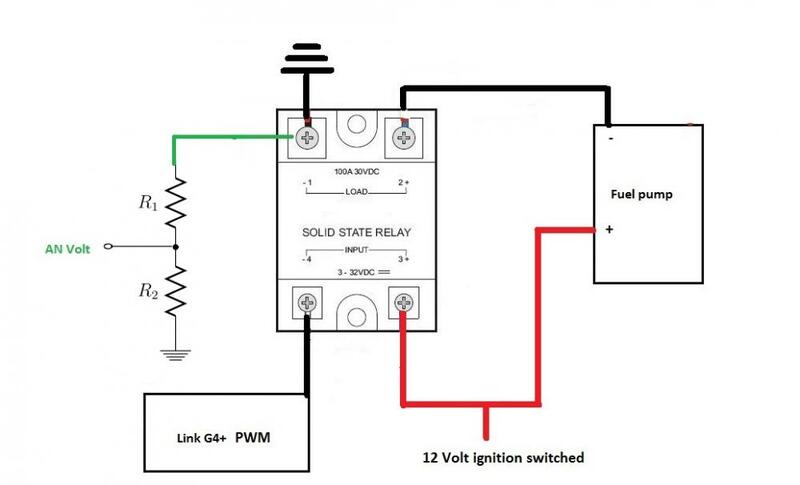 Looking for advice on how to wire this up, understanding that factory fuel pump relay needs to remain as master on/off control (rpm=0=pumps off). 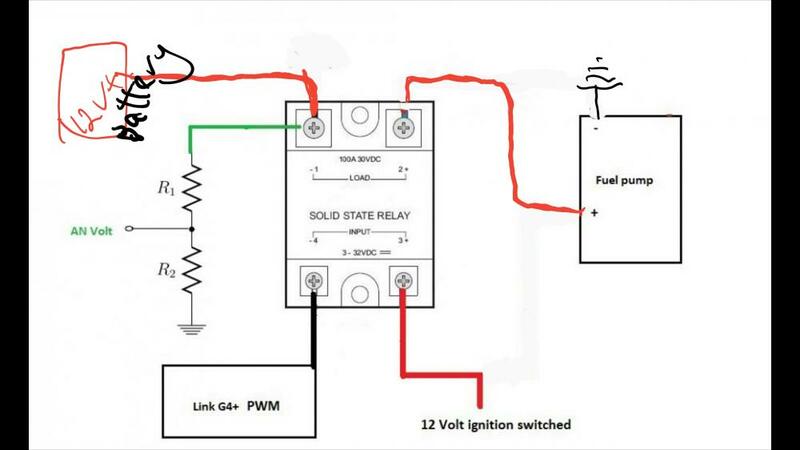 Can I have the OE fuel pump relay control feed Pin 2 in this diagram? Both pumps earthed directly to battery. 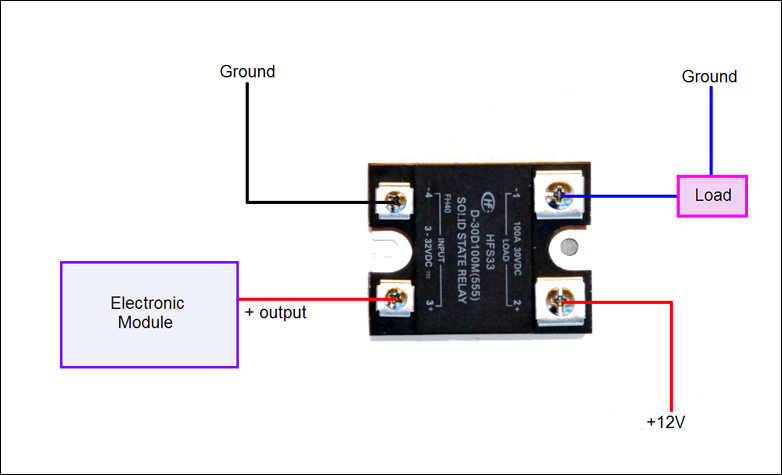 I also need to ask about the use of the diode, and if it is required, and if so, how to know which one and where to put it? Ideally the ECU aux will be connected to the -ve terminal (terminal 4 in your photo) assuming the relay can work that way. Pin three would then just be ign switched +12V. Set the ECU aux up as "FP Speed" and set it to open loop mode. The ecu will then still take care of the prime and "rpm=0=pumps off". You will not need the original FP relay to do this. 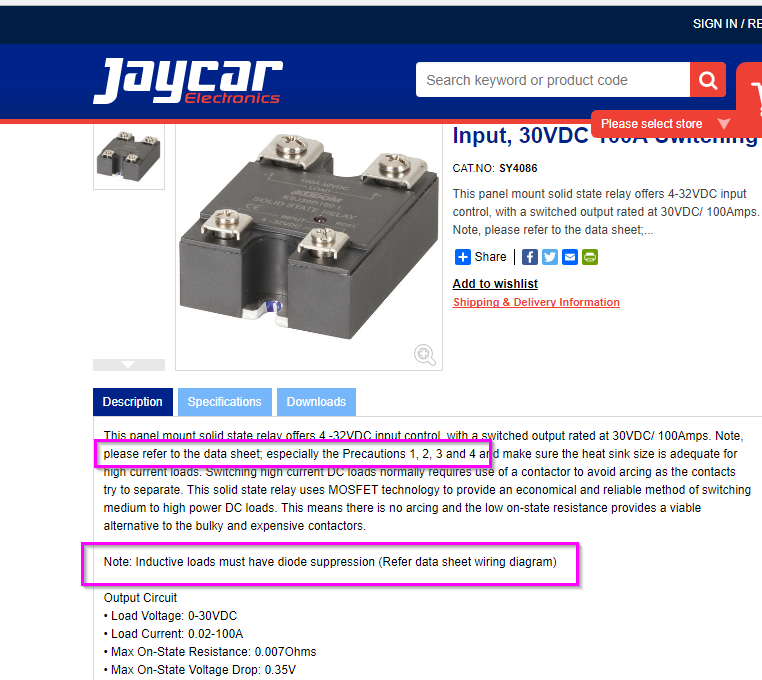 If your relay datasheet states it is suitable for inductive loads then you will not need a diode. If it is not designed for inductive loads then you will need to seek the suppliers advice on a suitable diode. Thanks Adam. The SSR I have is the one from Jaycar in the original post in this thread. What I took from your post, is that the trigger for the relay should be as per Ducie's last diagram, which I have modified below. Any issues with this? 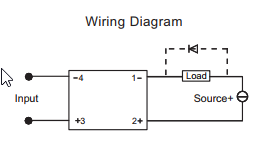 Actually, Ducie's last diagram is why I asked about the diode, as it is not in his final, but was in the earlier ones. Their datasheet doesnt seem to match their description. It says to refer to the datasheet, but the datasheet doesnt show any diagram and also doesnt have "precaution 1,2,3 etc"